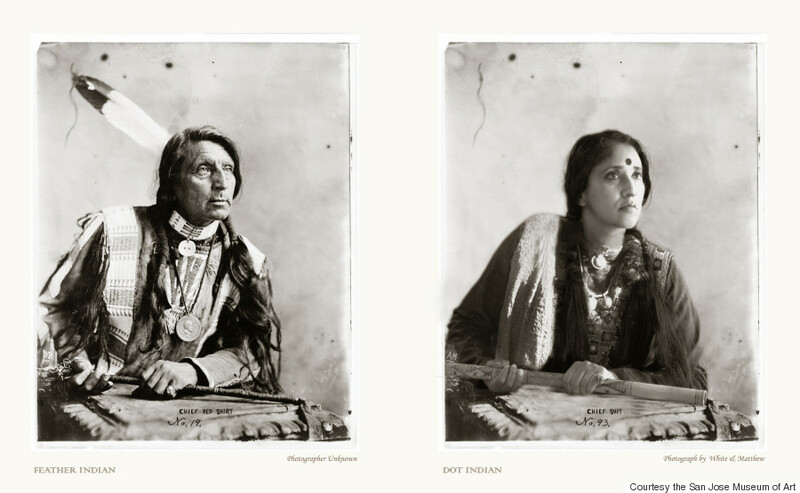 From 'Postdate': In Featherdot, from her 2001 series “An Indian from India—Portfolio II,” artist Annu Palakunnathu Matthew reenacts iconic photographs of Native Americans by photographers such as Edward S. Curtis and prints them next to the original image. Courtesy of the artist and sepia EYE, New York. From a purely mercenary standpoint, there has never been a better time in humankind's history to be an artist from India. The past few years have brought dizzying growth both in the domestic art market and in demand abroad, turning sculptors and painters from Delhi and beyond into multimillionaires. But in terms of widespread visibility, it's still rare to see names from the subcontinent on the walls of museums outside the country. Except in the hippest galleries of Manhattan and London, Indian pieces in the world's great museums tend to be the kinds restricted to the historical rooms: sixth century bronzes sharing space with Egyptian sarcophagi. Thanks to some scheduling serendipity though, this spring audiences in the American Southwest and the Northeast can feel as if they've performed a spectacular bit of time travel and dropped down into the Kochi Biennale and midcentury Bombay simultaneously. For no particular reason (except perhaps the general mania gripping the art world this year over all things non-Western), two unrelated museums are offering a view of some of the greatest Indian artwork of the past seven decades. 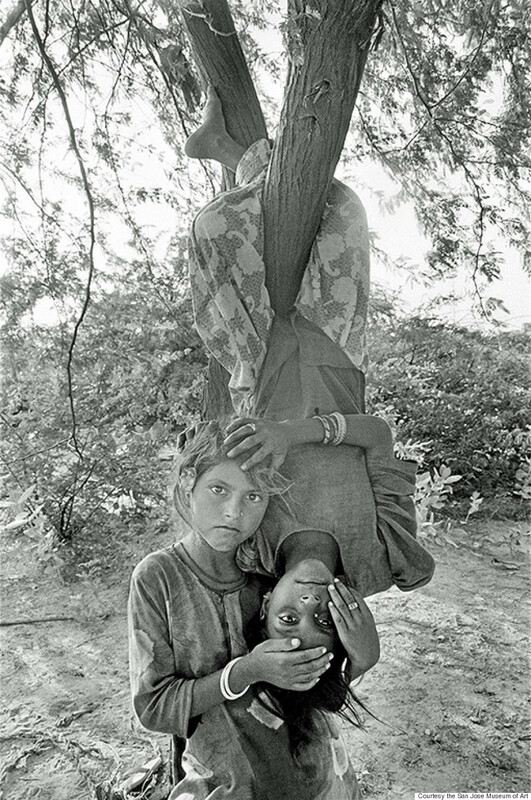 From 'After Midnight': Atul Dodiya, Three Brothers, 2012 – 13. An installation with 3 cabinets. Starting in the east, for thematic sake: "After Midnight," at the Queens Museum in Corona Park, New York, brings together works from two critical periods in India's history. The title references Salman Rushdie's great Independence-themed novel, Midnight's Children, about a sampling of characters all born at midnight on August 15, 1947, the moment India became a free country. 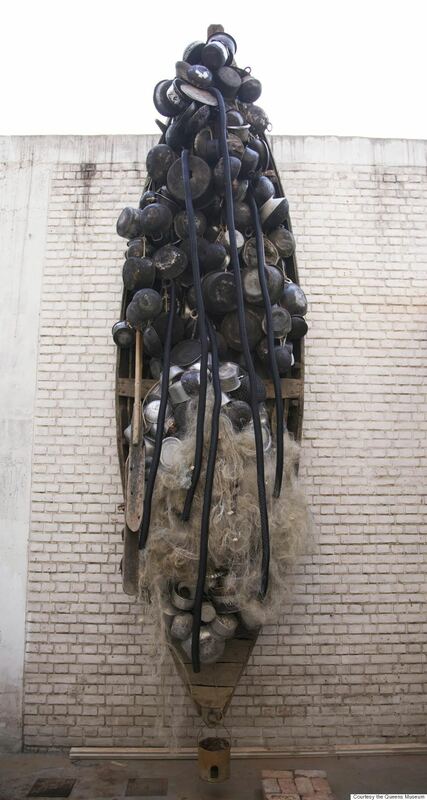 From 'After Midnight': Subodh Gupta, What does the room encompass that is not in the city?. 2014, Found boat, found objects, found utensils, fabric, steel, found fishing net, bamboo, rope, plastic pipe. The chronologically first era explored in "After Midnight" too is immediately post-Independence, a time when the art world's bright young things belonged mostly to the abstract Bombay School -- members now gone but hardly forgotten, like the late V. S. Gaitonde, Tyeb Mehta and M.F. Husain. 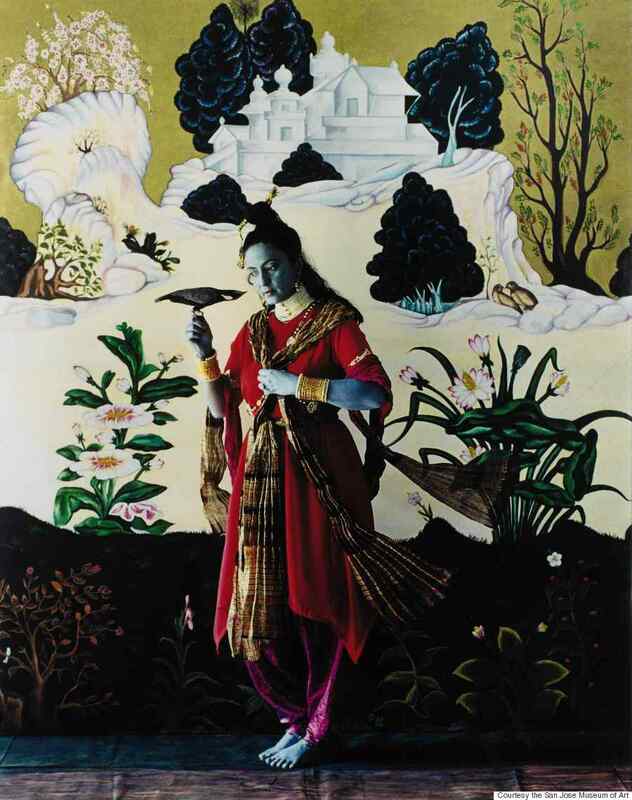 All of the above artists figure into the Queens show, bespeaking the fact that they remain among India's most recognizable (and bankable) art figures. 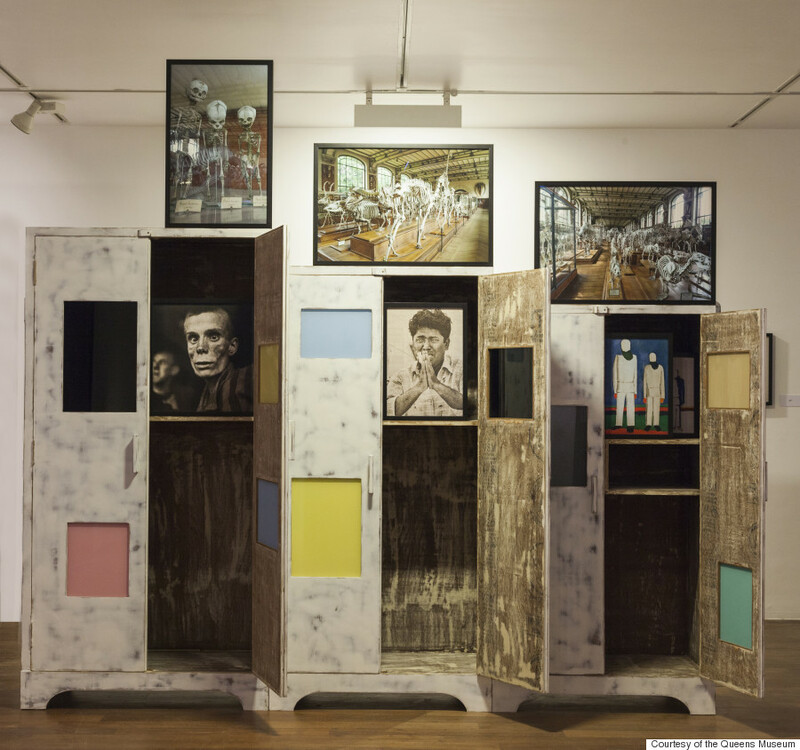 From 'After Midnight': Mithu Sen, (Sexualized) Museum of Unbelonging, 2014. Courtesy of Chemould Prescott Road, Mumbai and the artist. The exhibit leaps to another milestone year, 1997, when the country celebrated 50 years since the critical midnight. This is not simply to mark the occasion: the late nineties were a time of paradigmatic changes in the world's largest democracy, from the growth of a true Indian middle class, to the rise of both the economic powerhouse that is the outsourcing industry, and a vociferous religious right. 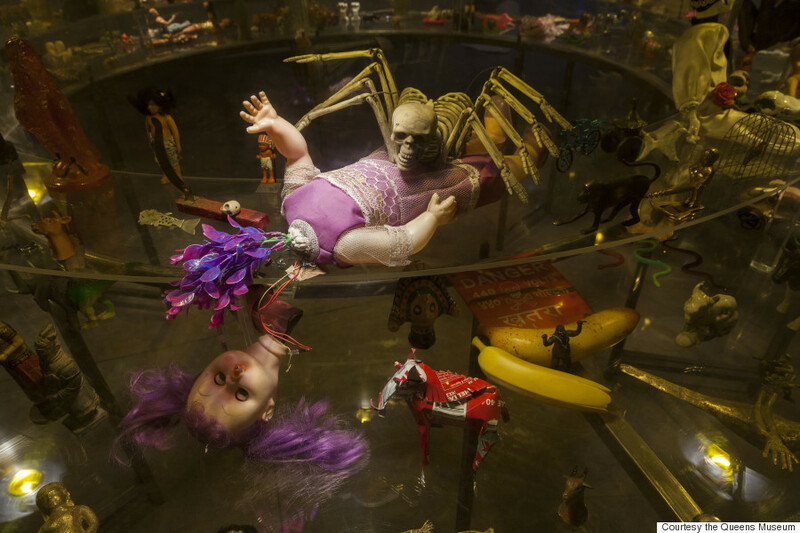 This bulk of the exhibit spans the years since, moving from the two-dimensional world of paint and canvas to sculptures built of found materials and video, work that sits squarely inside the current global artistic zeitgeist. 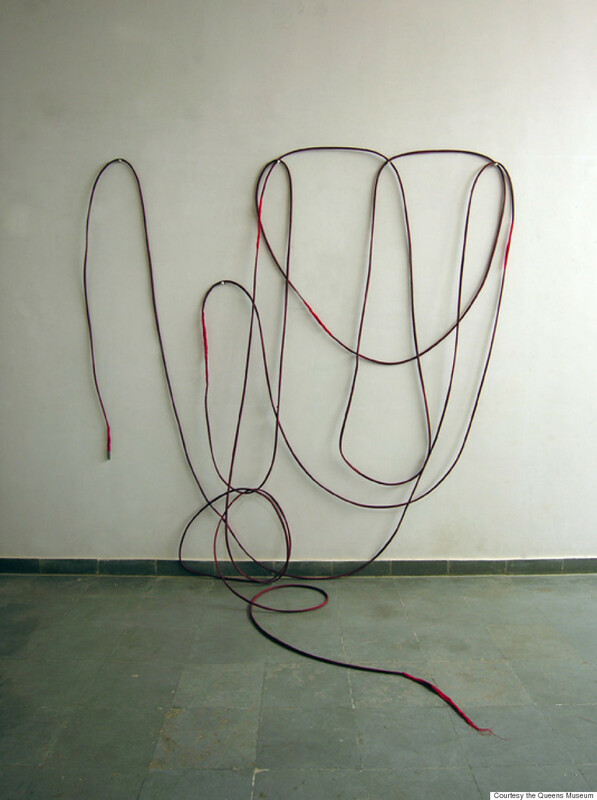 From 'After Midnight': Sheela Gowda, Untitled. 1997, Thread, pigment and 64 needles. One single cord measuring 84 inches. Contrast the broad survey course spirit of the Queens show with the subversive sharpness of its accidental companion down South. At the San Jose Museum of Art, "Postdate" focuses exclusively on contemporary photography by Indian artists grappling with colonialist imagery. From 'Postdate': Vivan Sundaram. Quartet. 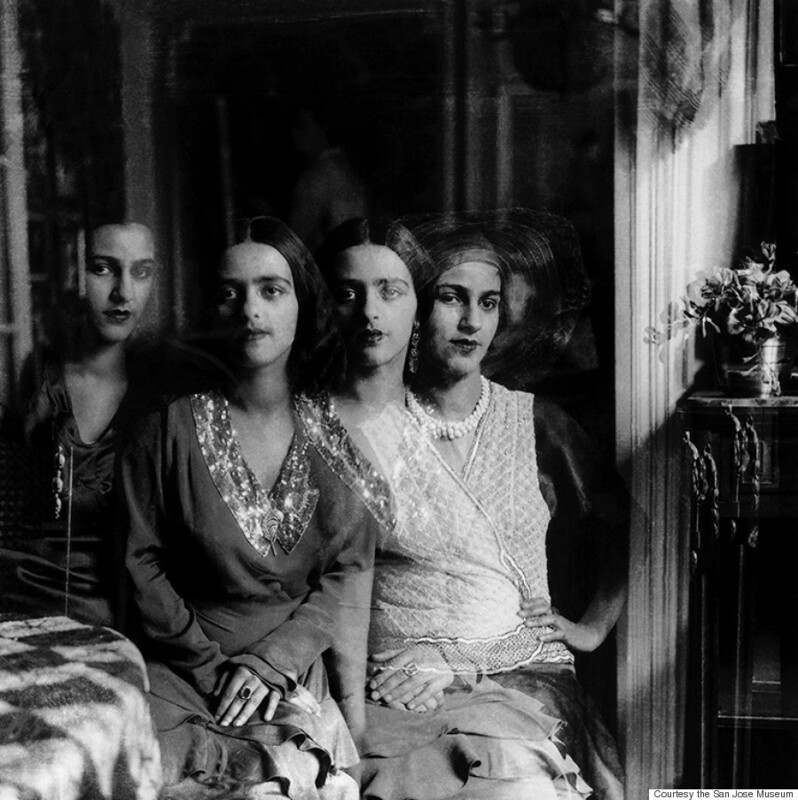 (double-exposure by Umrao Singh; portraits of Amrita and Indira, Paris, 1931), from the series “Re-Take of Amrita,” 2001 – 2002. Courtesy of the artist and sepia EYE, New York. For decades, photography has been a part of quotidian Indian life, with such Sears-like contemporaries as GK Vale, where everyone's grandparents went to get an unsmiling family portrait done. But it was only at the height of the British Occupation in the 1850s that the practice took root both commercially and artistically. Driving its popularity were masses of British colonials eager to document the exotic nature of their new homeland, like so many teenage Instagrammers let loose in Papua New Guinea. To satisfy these patrons, photographers both British and Indian focused on the most blatantly indigenous of the country's many subjects, from the Taj Mahal (still a favorite of amateur documentarians) to decorated elephants carrying British officers dressed unsuitably for the heat. From 'Postdate': Gauri Gill. Jannat, Barmer, from the series “Notes from the Desert,” 1999-2010. San Jose Museum of Art. Gift of Wanda Kownacki, the Lipman Family Foundation, and Dipti and Rakesh Mathur. "Postdate" joins the images of acclaimed solo artists like Gauri Gill with those of photography collectives. All the artists included drew inspiration from various source material, among them Bollywood film stills, archaeological surveys belonging to the East India Company, or 20th century hand-painted studio portraits. (At that old stalwart, GK Vale, for instance, it was common to brighten a subjects' eyes and lips in the standard black-and-white photograph with candy-colored daubs of paint). From 'Postdate': Gauri Gill. Licchma and Laali, from the series “Balika Mela,” 2003/10. Courtesy of the artist. The artists in "Postdate" do their part to "reclaim history," to borrow the words of Jodi Throckmorton, the Philadelphia-based curator who worked on the San Jose exhibit. 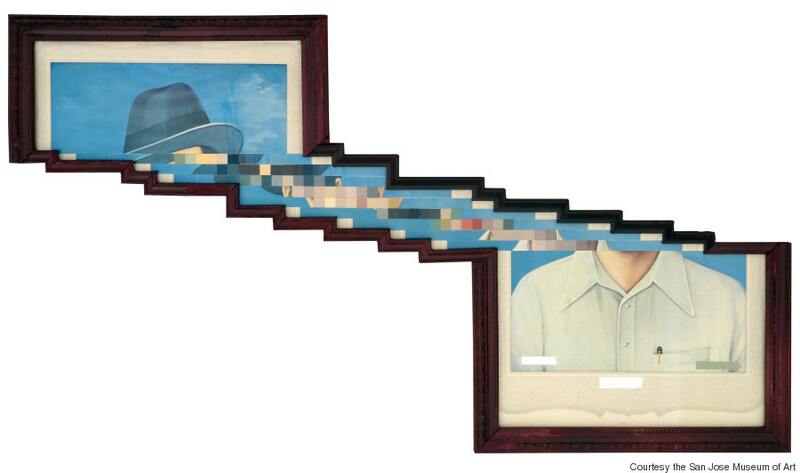 Each work reveals a contemplation of time past. From 'Postdate': Nandan Ghiya. Download Error, DSC02065, 2012. Photographs, acrylic, and wooden frames. Courtesy of the artist and Exhibit 320, New Delhi. Photograph Ranjita C. Menezes. In a single piece, photographer Jitish Kallat merges multiple shots of the construction of modern Mumbai in the 1800s to capture the rapid fire speed of urban development, the sometimes overnight conversion of the concrete into the stuff of memory. Annu Palakunnathu Matthew turned her lens outward, exploring the connection between representations of native peoples in early portrait photography. Taken together these exhibits offer a more complete view of Indian concerns than most singular shows. In the work of the country's well-known artists, there is forward energy. The Queens Museum tracks this historic rush ahead via the path of the Bombay School to today's blue-chip practitioners, though it is a story that can also be told in statistics, or in the changing homes of ordinary people. "Postdate" shows the forces that can hold a country back: a shadow of oppression, or ingrained feelings of cultural inferiority, rich matter for artistic transfiguration. Either way, it's a good time to be an Indian artist. Learjet-less? Head to the museums' sites for a wider look at "After Midnight" and "Postdate." CORRECTION: A previous version of this article located the museum in Long Island City; it is in Corona Park.